and members of the Progressive Party. No, not the Communist Party. It was known as the Progressive Party in 1948. I was 11 years old when we moved there. My father was out of work due to the Depression. After desperately looking for a job and a home for us, he found a concrete block and glass house which was architecturally designed by Louis Kahn in the Bauhaus style. Little did I know then that this little town would become one of the Heritage communities in New Jersey and part of a “Homestead” movement founded by President Franklin D. Roosevelt. It was to be one of the most idyllic childhood memories of my life. It was called “The New Deal,” Roosevelt’s vision put thousands of people to work building bridges, houses, painting murals, farming, etc. The homesteads provided factories so that folks could work and live in the same community. My father got a job in the clothing factory. It was a vision of a genius. My best friend was Susie Shahn, Ben and Bernarda Shahn’s daughter. We climbed trees, rode our bikes, fished in the lake and played softball with the boys. We were labeled Tom Boys. We didn’t care. We never kept in touch after we moved to Trenton but I found out many years later that she went to live in London and died from liver cancer. My brother, Barry, and I went to the public school. My class consisted of 12 students who came from different backgrounds. Joel Levinson went on to fame as a director on Broadway. I’ll never forget the day we were standing in line for 8th grade graduation and he said, “Ya know Barbara you’re not going to get along with the boys in high school. They don’t like flat chested girls.” I hated him after that. Tony and Stephan Martin used to come over after dinner during the summer with their guitars. We sang folk songs for hours: Pete Seeger and Woody Guthrie were our favorites. Some nights we all ran around collecting fireflies in jars. We lived near the pine barrens and the wildflowers, strawberries, skunk plants and ferns were plentiful and glorious during the summer. We built huts out of dried out pine branches and played hide and seek. My mother and father struggled. It seemed like all my friend’s families were struggling then so there were no “rich” kids. We had one phone in the house. When it rang we all scrambled to answer it! My father taught us how to plant a garden and, of course, I’ve been an enthusiast ever since. My mother was not a happy person. She would be labeled bipolar today. We never knew what we would find when we got home from school. A sweet lady or a screamer yelling at us to get to work and clean the house! all wrapped in wax paper. Lemonade and pickles topped them off. Growing up in Roosevelt was a wonderful, idyllic childhood memory. I only wish my children and grandchildren could have known such an innocence. Barbara and her husband, Ron, moved to Aldea in 2004 from Los Angeles. Barbara was a teen leadership organizer for the State of California and retired from the Los Angeles County Office of Education in 2003. Their decision to move to Santa Fe was their daughter, son-in-law and grandchildren live in Albuquerque – what better reason??? In the manner of Issa, this haiku takes a look at the passing scene, but an intimate one. As reader, I get a lot of immediate context. Usually life is well regulated–and not all societies have “bedtimes” for children. But now there is a party or holiday and everyone is out. The image of the square brings to mind a medium-sized town or community–a shared outdoor space. And these festivities have overridden the usual, because the toddler is up at all hours. And energetically able to keep up, too, dancing away. It’s a sweet moment, and like all moments in both haiku and toddlerhood–fleeting. My grand-daughter Grainne Rose is almost a month old. That’s exciting because she came a month early, so she’s approaching her due date! But she has been out in the air with us for long enough for me to wonder what she perceives. It’s a gradual process, coming into collective consensus reality. Three days ago, I got a script for my usual pain meds. There was something missing on the script, so back to the medical office. “Is this script now ok? Totally ok, no problems?” I asked the pharmacist. Yes, yes. Today I went to pick it up. I was told no, it’s a controlled substance, you have to wait 28 days in total before a refill. This is day 27. Why are you trying to pick it up now? The short answer–because the script has almost run out. I doubt if she wants to hear about my getaway plans for tomorrow, or the excitement of my slightly confused journey towards Medicare, or how I’m juggling a gallery deadline and a new grandchild. The slightly longer answer–I thought it would be convenient for me. “And don’t you have any pills left?” she asked. I just glared. That’s not really her business, is it. But…my buttons have been pushed. I do live in fear of pain. My meds were once considered an analgesic, but the war on drugs changed that. To calm myself down I remind myself that I have many tools for pain, not just this one. But I wonder why society has seen fit to shame and frighten me. An excerpt from “The war on opioids is saving lives. But it’s also killing people like me.” By John Heubusch. I am not alone. Victims of tragic accidents, disease onset, combat wounds, complicated surgeries, workplace injuries, gun violence or even a simple fall off a ladder are among the 20 million Americans like me who experience some form of high-impact, chronic and often debilitating pain. Many, given a second chance at life after a serious illness or injury, tragically choose suicide over pain. Why? The most unfortunate among them, those with life-altering, unspeakable pain, are being denied access to the medications they need to go on. Their doctors, now numbering nearly 70 percent of our front-line physicians, have enlisted in the nation’s war on opioids. Many have turned away from their patients in chronic pain. John Heubusch is a novelist and the executive director of the Ronald Reagan Presidential Foundation and Institute in Simi Valley, Calif. His website is here. 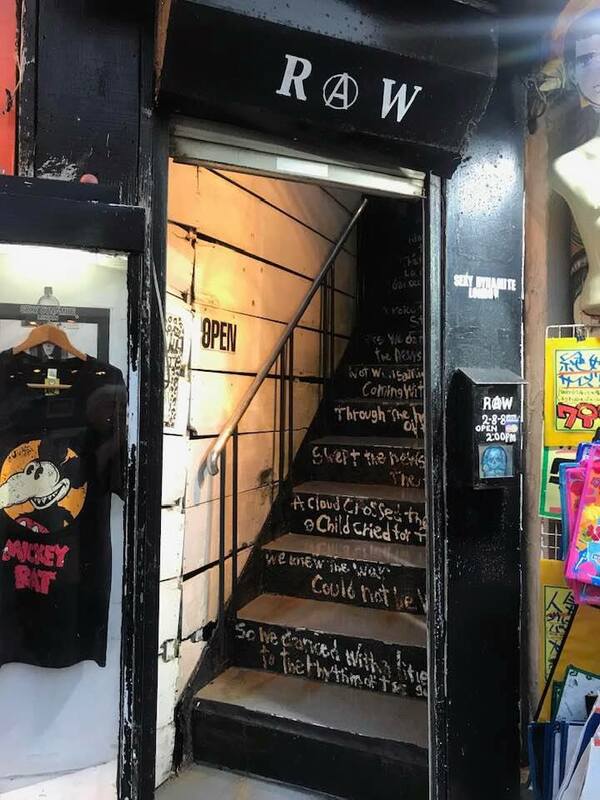 From Carolyn Winkler in Naha Okinaw, on the stairway up to a bar named RAW. When Trump got installed and continued his horrible tirades against immigrants and refugees, then began his daily executive orders designed to keep immigrants out of the country, I, like most sane people, was incensed and disgusted. What could I do about this? Aside from donating money and attending immigrant rights’ protests and forums, I decided I needed to do the thing I’d been trained for—teach immigrants English. In the late 1980’s when Reagan was president, he was despicable too, except he did one good thing—he created a law that allowed amnesty for millions of people in the US who were undocumented. It was an incredible time, the late ‘80’s—I’d just finished another year of teaching elementary school in downtown LA, when the word got out that LA Unified School District was looking for teachers for adult students seeking English classes. The answer to the dumb question of “Why don’t ‘those people’ want to learn English” was easily answered—all you had to do was look at the lines of people five blocks long, all waiting patiently to register for classes! Some schools like Evans Adult had classes all around the clock—noon, 2 pm., 4 pm., 6 pm., 8 pm., 10 pm., midnight, 2 am., 4 am., 6 am., 8 am, 10 am. THAT’S how many people wanted to learn English! And that was just at ONE school in ONE city, Los Angeles. The students had simply been waiting till it was safe to come out of the shadows. If La Migra (or ICE) is going to grab you when you try and register for school, you’re not going to do it! Those years of teaching adults English and Civics were among my most satisfying times as an instructor. I taught Level 1 at four different schools, and after each 8 weeks of class, students could take the test—if they passed it, they’d get their green card. I don’t speak too much Spanish, so we all helped each other. We had parties for every holiday and a few amazing women taught me salsa dancing. I looked forward to every class and in spite of students working 10 and 12 hour shifts, they rarely missed a day. They were largely Spanish-speaking but there was also a tailor from Israel and a magician from Russia who once pulled a pigeon out of a hat and was about to do a trick involving fire but I knew it would set off the ceiling sprinklers so I stopped him, mid-trick! We also sang songs in English like Elvis Presley’s “Blue Christmas” and “Yesterday” by the Beatles. When I first moved to Santa Fe in the early 1990’s, I taught ESL at UNM Los Alamos—often my students were the spouses of scientists who worked at the Lab. Again, my pupils were varied—this time from China and Russia and Japan, and once more, they were hard working, motivated and generous with each other. Then for the following 25 years, I instructed young students in English composition and creative writing. Many pupils were immigrants from Mexico and Central America. And in spite of some harrowing stories of how they and their families had gotten to the US, they often were the highest achievers in the class because they were so diligent, motivated, and appreciative of education. But back to 2017—I signed up with Literacy Volunteers at SFCC on the nights I was not teaching other classes. I began teaching Rodrigo (not his real name) in March of 2017. I will tell you his story, though I also have instructed other ESL students since then. often. I suppose I could go to a new country by myself and learn a completely new language and culture with no real instruction, but it takes bravery, resilience—and persistence! Rodrigo has made a living here in the US, got married, had children and grandchildren, and now he has his own construction business. He also does carpentry work for a local hotel. On election day in 2016, he had two knee replacements and went back to work with a walker only three days later. He is tough. I explained that the ‘gh’ is silent and words are not always pronounced the way they are spelled. English is a combination of French, German, Latin, and the rules don’t always make sense, especially since there are many exceptions. Obviously learning a new language—especially English–is hard, and it takes a lot of time—particularly when you are also working two jobs. Rodrigo sometimes got frustrated but he kept coming to class. One of his goals is to help his brother, Juan, get into the US since he can’t find a job in Mexico. But as we know, now that THE WALL is the Current Occupant of the White House’s main obsession, Juan will have to wait. Plus, becoming an American citizen is not a simple task. To become a US citizen, you have to be skilled enough in English to take a written test and an oral test besides. All your papers have to be in order, of course, and you have to know the answers to 100 questions about the US system of government and history. A few of the questions are easy, like, “How many stars are on the flag?” But many are challenging, for example, “What year was the Constitution written?” And “Who wrote the Federalist papers?” And “What territory did the US buy from France in 1803?” I have two questions: Do TRUMP VOTERS know the answers to these questions? And, could Trump pass the Citizenship test? What can I say? I agree with him but tell him he should probably not ask the Citizenship Examiner that question if he wants to pass the test. Miriam Sagan and Isabel Winson-Sagan have a few upcoming shows and workshops this summer! We will be back at the Japanese Cultural Festival on May 11th, offering a free demo of suminagashi printing. The festival is at the Santa Fe Convention Center and costs $5 for adults, free for children under 12. Visit Santa Fe Jin’s website for more information. Then on June 8th, we will be presenting on our work as the art collective Maternal Mitochondria from 1 pm to 3 pm for Santa Fe Book Arts Group. This is free and open to the public. This will be followed on June 9 by a workshop on suminagashi & poetry from 9 am to 4 pm. The workshop is $75 and is only open to members of BAG. If you are interested in becoming a member, please contact BAG directly at http://www.santafebag.org. And finally, from June 21st-August 24th our work will be featured in a group show at the Peters Project gallery, “Speaking to the Imagination: The Contemporary Artist’s Book.” Looking forward to seeing some of you at these events! Please note : there are a few remaining spaces if you know anyone who would like to attend. Class Size: Limited to 12 participants. Cost: $ 75. To register, send a check for $75 payable to BAG, to Laura Wait, 108 Calle Francisca, Santa Fe, NM 87507. Sunday, June 9, 9-4 at the College in the Fine Arts Building Room #710. Saturday, June 8, 1-3. Board room. The Collaborative mother/daughter duo of writer Miriam Sagan and multi-media artist Isabel Winson-Sagan will share their projects. These include an art/poetry trail off of Route 14, collaborative public art piece in the Santa Fe Railyard, video, installation piece in an ancient silo in Japan, renga, and numerous geocaches. Their meditative studio practice is based on a contemporary version of suminagashi, Japanese style marbling, and free writing.. In addition to showing images and discussing our process we will have samples of our work and some free giveaway broadsides and books.